Faten Ali Naser is a 41-year old mother of four and housewife from Bahrain. She is currently in Isa Town Women’s Prison, serving a five-year sentence for allegedly harboring a fugitive and now awaiting an appeal scheduled for 28 January 2019. On 9 February 2017, as Faten was at her family home in the Barbar region of Bahrain, officers from the Special Security Force Command (SSFC), the Ministry of Interior (MoI), the National Security Agency (NSA), and masked officers in plain clothing surrounded the house on the ground and in the air. The officers were armed and had video cameras directed towards individuals in the house. Officers mentioned that they were from the Criminal Investigations Directorate (CID) and stated that they had a warrant, though no warrant was presented. Officers transported Faten to the CID, where Faten was detained under suspicion of harboring a fugitive (her nephew) and joining a terrorist group – the latter charge was dropped at trial. Officers forcibly disappeared her for three days starting on 9 February 2017. She was finally able to communicate with her family to inform them of her whereabouts on 12 February 2017. In that period at the CID, authorities interrogated Faten and threatened her parents’ lives. In addition to multiple insults and degrading comments directed towards her concerning her Shia religious beliefs, officers also denied her requests for an attorney during interrogation. Authorities eventually transferred Faten to the Isa Town Women’s Prison on 12 February 2017 until her trial on 12 August 2017. In the lead up to her trial, prison authorities allotted her only brief and limited calls to her assigned attorney, resulting in little time to adequately prepare a defense. She had one meeting in person with her attorney, but officers remained present and closely monitored the meeting, preventing her from speaking freely with her attorney. On 31 January 2018, Faten was sentenced to five years in prison. After sentencing, she was transferred back to Isa Town Women’s Prison, where she is currently serving her sentence as she awaits appeal. Faten has reported a deterioration in health since her imprisonment and suffers from diabetes and irregular blood pressure, both of which require close monitoring, checkups and medication. 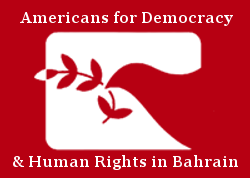 Americans for Democracy & Human Rights in Bahrain (ADHRB) calls on Bahrain to uphold its human rights obligations by annulling the sentence against Faten, and further ensuring that any subsequent legal proceeding is conducted in line with international human rights laws and standards. The lack of a fair trial, as evidenced by the lack of a warrant, and the denial of access to an attorney indicates numerous violations of international human rights law, including the International Covenant on Civil and Political Rights (ICCPR). We call on the Government of Bahrain to investigate concerns raised regarding unfair trials and coercive interrogation tactics – including threats and the use of discriminatory insults – ensuring an investigation that will hold responsible officers accountable and ensure fair trial rights to all those accused. Further, the prison administration must ensure adequate medical care for Faten and for all prisoners in its care, in accordance with Bahrain’s obligations under the International Covenant on Economic, Social and Cultural Rights (ICESCR), and in conformity with the United Nations Standard Minimum Rules for the Treatment of Prisoners (or the Nelson Mandela Rules).